Craig MacGillivray is revelling in regular first-team football at Pompey. The Yorkshireman revealed he’s loving life at Fratton Park after establishing himself as Kenny Jackett’s No1 keeper. MacGillivray arrived at the Blues on a free transfer in June having made a combined total of 20 Football League appearances during spells at Walsall and Shrewsbury. But the 25-year-old has made an impressive start at PO4 after dislodging Luke McGee between the posts. He’s been ever-present during Pompey’s unbeaten opening to the League One season, registering three clean sheets and conceding only three goals in six appearances. 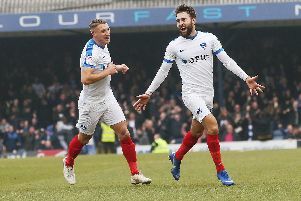 And MacGillivray, who is expected to be rested for Tuesday night’s Checkatrade Trophy clash against Gillingham, believes there is no better feeling than playing on a weekly basis. He said: ‘It’s the best thing ever. There’s no better feeling than playing games. ‘At the minute, I am loving life – literally. When you’re winning games as well there is no better feeling. MacGillivray was unfortunate to be behind two talented keepers at his past two clubs. Neil Etheridge was first choice at Walsall. He’s now No1 at Premier League outfit Cardiff City. Meanwhile, MacGillivray was below Manchester United loanee Dean Henderson in the Shrewsbury pecking order last season. He is at Sheffield United in the Championship this campaign. One of MacGillivray’s main frustrations at the Saddlers and the Shrews was not being able to address the areas of his game that needed working on in competitive scenarios. But he is relishing the opportunity to do so at Pompey. ‘Not being able to work on things was the main frustrating thing,’ added MacGillivray. ‘Every time I’d come in to the team I’d do well but then the next time was a long time before I could actually work on things. ‘My main thing was starting positions, working on them and doing repetition. ‘That only comes from playing games. It’s the same with the back four. You can only work on those things when you’re playing regular football together.